Lineage. Constituted as the 353 Fighter Group on 29 Sep 1942. Activated on 1 Oct 1942. Inactivated on 18 Oct 1945. Redesignated 116 Fighter Group and allotted to the National Guard on 24 May 1946. Organized on 8 Jul 1946. Extended federal recognition on 9 Sep 1946. Redesignated: 116 Fighter-Bomber Group on 25 Oct 1950; 116 Fighter-Interceptor Group on 10 Jul 1952; 116 Fighter-Bomber Group on 1 Dec 1952; 116 Fighter-Interceptor Group on 1 Jul 1955; 116 Fighter Group (Air Defense) on 15 Apr 1956; 116 Air Transport Group on 1 Apr 1961; 116 Military Airlift Group on 1 Jan 1966; 116 Tactical Fighter Group on 4 Apr 1973. Inactivated on 9 Dec 1974. 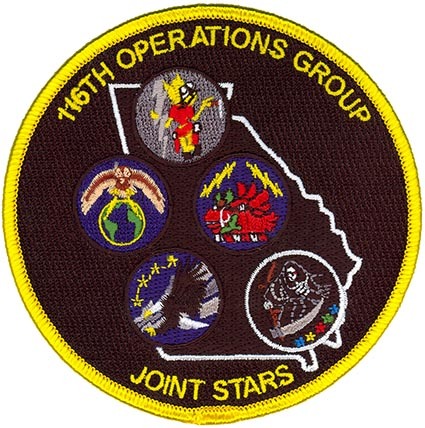 Redesignated 116 Operations Group on 1 Jan 1993-. Assignments. I Fighter Command, 1 Oct 1942-27 May 1943 VIII Fighter Command, 7 Jun 1943; 66 Fighter Wing, 18 August 1943 (attached to 3d Bombardment Division (later 3d Air Division), 15 Sep 1943-10 Oct 1945; Army Service Forces, Port of Embarkation, 16-18 Oct 1945. 54 Fighter Wing, 9 Sep 1946; Tactical Air Command, 10 Oct 1950; 116 Fighter-Bomber Wing, Provisional, Oct 1950; 116 Fighter-Bomber Wing, 1 Nov 1950-10 Jul 1952; 116 Fighter-Interceptor Wing (later Fighter-Bomber Wing, Fighter-Interceptor Wing, Air Transport Wing, Military Airlift Wing, Tactical Fighter Wing, 10 Jul 1952-9 Dec 1974. 116 Air Control Wing, 1 Jan 1993; 116 Air Control Wing, 1 Oct 2011-. (attached to Philadelphia Fighter Wing, c. 26 Oct 1942-c. 27 May 1943). Components. 12 Airborne Command and Control, 1 Oct 2002-1 Oct 2011; 16 Airborne Command and Control, 1 Oct 2002-1 Oct 2011; 128 Fighter Squadron (later 128 Fighter-Interceptor, 128 Fighter-Bomber, 128 Air Transport, 128 Military Airlift, 128 Tactical Fighter, 128 Bomb, 128 Airborne Command and Control), 9 Sep 1946-1 Nov 1950, 10 Jul 1952-9 Dec 1974, 15 Mar 1992-. 196 Fighter-Bomber 10 Oct 1950-10 Jul 1952; 350 Fighter (later 157 Fighter), 1 Oct 1942-18 Oct 1945, 28 Nov 1946-1948; 351 Fighter (later 158 Fighter, 158 Fighter-Interceptor, 158 Fighter-Bomber, 158 Fighter-Interceptor), 1 Oct 1942-18 Oct 1945, 9 Sep 1946-10 Jul 1952, 10 Jul 1952-10 Jul 1958; 352 Fighter (later 159 Fighter-Bomber. 159 Fighter-Interceptor, 159 Fighter-Bomber, 159 Fighter-Interceptor), 1 Oct 1942-18 Oct 1945 10 Oct 1950-20 Jul 1952, 20 Jul 1952-30 Jun 1956. Stations. Mitchel Field, NY, 1 Oct 1942; Richmond Army Air Base, VA, c. 7 Oct 1942; Baltimore Municipal Airport, MD, c. 26 Oct 1942-c. 27 May 1943; RAF Goxhill, England, Jun 1943; RAF Metfield,England, 3 Aug 1943; RAF Raydon, England, April 1944 – Oct 1945; Camp Kilmer, NJ, c. 16–18 Oct 1945. Marietta Army Air Field (later Marietta AFB, Dobbins AFB), GA, 9 Sep 1946, 10 Jul 1952-9 Dec 1974, 1 Jan 1993-. Robins AFB, GA, 1 Apr 1996-1 Oct 2011-. (Operated from: George AFB, CA, 1 Nov 1950-10 Jul 1952; Misawa AB, Japan, 1 Aug 1951-10 Jul 1952; Taegu Air Base (K-2), South Korea, 2 Dec 1950-4 Jan 1952; 26 May 1952-10 Jul 1952). Aircraft. P-40, 1942-1943; P-47, 1943-1944; P-51, 1944; P-51, 1944-1945. F-47, 1946-1950; F-84, 1950-1952; F-51, 1952; F-84, 1952-1955; F-84, 1955-1960; F-86, 1960-1961; C-97, 1961-1965; C-124, 1965-1973; F-100, 1973-1974; F-15, 1986-1996; B-1, 1996-2002; E-8, 2002-. Operations. Trained in the Mid-Atlantic states during 1942-1943 while also serving as an air defense organization. Combat operations in ETO, 1943-1945. As part of the Continental Air Command Fourteenth Air Force, the unit trained for tactical fighter missions and air-to-air combat. Called to active duty as part of the Korean War call-up, 1950-1952. Air Defense of the Southern US, 1952-1961. Flew long-distance transport missions in support of USAF requirements, frequently sending aircraft to the Caribbean, Europe, Greenland, and the Middle East, 1961-1974. Participated in a number of deployments and exercises around the world in the B-1B. Operats the E-8C Joint STARS battlefield surveillance aircraft providing an advanced ground surveillance and battle management system which detects, locates, classifies, tracks and targets ground movements on the battlefield, communicating real-time information through secure data links with U.S. Forces command posts. Campaigns Streamers. World War II: Air Offensive, Europe; Normandy; Northern France; Rhineland; Ardennes-Alsace; Central Europe. Korean War: UN Summer-Fall Offensive; Second Korean Winter; Korea Summer-Fall, 1952. Decorations. Distinguished Unit Citation: Holland, 17-23 Sep 1944. Emblem. Approved 6 Jun 1952.